A career with Realty Executives Dillon is a career filled with success. We’re not just agents, we’re local experts. We know the neighborhoods we serve. We know who built the homes in our communities. We know the area’s development plans and zoning details. We know the schools and local businesses. We know the other real estate brokers in town and their agents. And we know how to protect buyers and sellers. But perhaps most importantly, we know that a community thrives when a family makes it their home — a home that you help them find.d.
" Your raise is in effect ... when you are! " ​At Realty Executives Dillon, top-notch real estate professionals apply our exclusive systems to produce dramatic results. From the owners of our franchised offices, to our sales associates, our staff, to the homeseller and homebuyer, everyone shares in the success that Realty Executives Dillon cultivates. Before you can take the real estate license exam in California to become an associate, you must a complete a training course known as Real Estate Principles. We offer an online version of the Principles course that allows you to set your own pace for training and study from any location you choose. Once you've completed your Real Estate Principles through our classes, you will be able to apply for your Real Estate license exam at the California Bureau of Real Estate (DRE). Our online version of Real Estate Principles is a challenging course. It teaches students all of the fundamental concepts of real estate using animation, talking characters, photographs, and proven online learning methods. This communication is not intended to offer a Realty Executives franchise, nor solicit a change in your affiliation. It is merely an offer of information about Realty Executives Dillon. Why join Realty Executives Dillon over another brand? 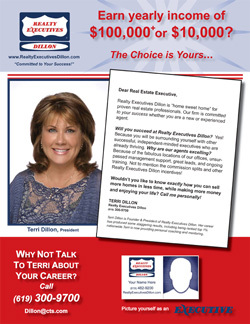 Terri Dillon has dedicated her life to a career in real estate. Regarded as one of the most knowledgeable brokers in San Diego, she has made it her goal to provide the best of services to the residents of San Diego. She provides hands-on-training with all of her Executives and holds Sales & Contracts training for anyone who is interested in a career in real estate. She provides all the tools necessary to create a positive and successful environment. No broker backs their agents better than Terri Dillon. With a dedicated staff, we look forward to assisting you in becoming a success! To address the modern consumers’ craving for high-tech tools in their real estate transactions, we provide Executives a PrimeAgent technology suite that includes an agent website, contact manager, drip marketing campaigns, print marketing materials, on-demand mobile marketing, a fully stocked training center and concierge support that answers three times the questions in a quarter of the average time. Realty Executives International holds a big business network and is an established brand internationally. From local support to an international presence, there is no reason why you cannot make the change necessary to become an "Agent" to Executive. Terri Dillon has been servicing San Diego for nearly 25 years. With brand recognition and a wealth of unmatched real estate knowledge, whether it be Sales & Contracts or Real Estate Law & Principles, Terri has dedicated her life to a career in real estate. Come see why Realty Executives Dillon is considered one of the friendliest brokerages in San Diego. Promote yourself from "Agent" to Executive today.